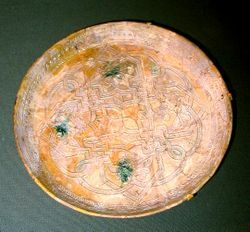 This earthenware dish was made in 9th century Iraq. It is housed in the Smithsonian Institute in Washington, D.C. Starting about 400 years after the period, influential figures in the early phases of the Renaissance would refer back to these times, and the 3 centuries previous, as the "Dark Ages". The reference based on the eclipse of the Western Roman Empire, after AD 476, and the general loss of classical art forms, reduction of urban centers, and diffusion of political power to a petty level. Regional enities never grew to the level of nationhood, let alone empire. Only the Roman Catholic Papacy had true international power, and this was somewhat limited due to poor communications between the regions of Europe. Classical civilization's former record was preserved by the efforts of Catholic monks hand copying manuscripts, but since only a tiny percentage of the populace could read and write, little information or knowledge was disseminated. Most western people were engaged in rural agriculture, and the Roman cities were largely in ruins. Still, certain arts, related to the Church and the ruling class, led to at least a small degree of support to artisans. 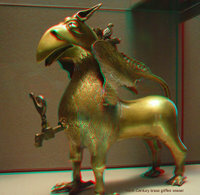 There is a legacy of brass and gold objects preserved in the world's museums from the Europe's "Dark Ages". Muslim traders settle in the north-west and south-east of Madagascar. 800 - Arab fleet sails up the Tiber. 850- 875 - The first Norse settlers arrive on Iceland. 867-onward Revival of the Byzantine Empire under the Macedonian dynasty.